1. Cook ground turkey in skillet until browned. Drain. Add taco seasoning packet and water. Cook about 5 minutes or until sauce is thickened. Add diced tomatoes. Bring to a boil. Reduce heat. Cover and simmer about 10 minutes stirring occasionally. 2. Add pinto beans. Cook uncovered another 5 - 10 minutes or until liquid from tomatoes is reduced. 3. 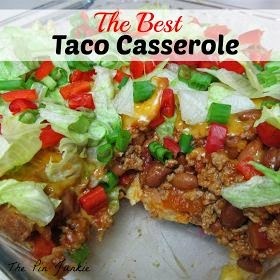 In an ungreased 2-quart casserole dish, place broken tortilla chips or taco shells. Top with beef mixture. Sprinkle with cheese. Microwave about 3 minutes to melt cheese. 4. Top with lettuce, green onions, and red bell pepper. Serve warm.